Much has happened since the Millennium where the feedback over those years from developing products to keep pace with industrial needs has driven the development of ubiquitous items like quarter-turn locks and latches which form a core range with companies such as EMKA (UK). In the 1990’s a typical ¼ turn lock was IP54 rated in simple die casting without additional sealing. Firstly flat seals were introduced, then “O” rings, and finally PUR injected seals leading to sealing now commonly available up to IP69. An early requirement was to look at new materials where leading companies developed capability with reinforced polyamide – for reasons of cost and corrosion resistance as well as stainless steel, which added exceptionally rugged characteristics and corrosion resistance suitable to wash-down areas and marine environments. As plastics technologies developed greater strength and rigidity were possible so that slim-line polyamide cams could be produced offering cost benefits and reducing paint damage to cabinets. At that time simple back nut fixing was the norm but was time consuming where multiple panels were being assembled, so EMKA designed a range of “quick-fit” products which push-in and clip-fix. The humble ¼ turn latch lock was changing incrementally with customer demand for smooth, cavity-free designs suited to food processing plants and high sealing to withstand regular pressure washing. At the other end of the scale outdoor environments and rail or other transport vehicles have their needs met with high speed dust cap retention and colour coded open/closed indicators. Perhaps the biggest change in the world of ¼ turn locks and latches has been the spread of compression function products. These now offer vibration resistance to prevent nuisance door opening, as well as more complete gasket pull-down and consistently higher IP sealings. Pre-2000 traditional L and T handles were being challenged by relatively new styles of pop-out swinghandles in simple die-cast zinc. These handles offered lower profiles to minimise damage and clothing hazards, while providing convenient, comfortable operation for the user. Parallel developments took place comparable to ¼ turn locks – it is amazing how usage has changed in those years and how products have changed to meet those needs. For similar reasons – enhanced environmental requirements, cost and user friendliness – swinghandles are now produced with “O” rings and PUR seals giving excellent sealing for all applications. Glass reinforced polyamide was introduced as the industry developed slim, strong handle designs alongside stainless steel variants in AISI 304 or 316. These reinforced machine grade plastics proved extremely capable such that robust anti-vandal designs were possible in these and zinc die – often complimented by low profile escutcheons and inset handles for sealing and anti-tamper purposes. Just resisting unauthorised access or simple damage however was not enough – in those years we have seen the flowering of the internet and the growth of big data – vulnerable to physical theft. Enter Electronic Locking – developed by EMKA to protect server cabinets and industrial electronic control systems from unauthorised access. Simple electronically verified swinghandle based protection soon developed into networked systems which could be remotely monitored and authorised. The Agent E stand-alone wireless system was one approach for single or small numbers of cabinets. For larger installations where building access and complete physical access control is required right down to the individual cabinet or compartment, then Biometric systems have arisen with integrated locking, electronic monitoring of access logs and cabinet environment, full reporting and control over the internet, fully encrypted giving world-wide connectivity. 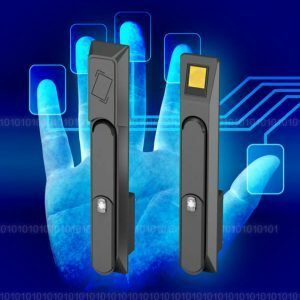 Addition of the EMKA BioLock with integral fingerprint reader to the ELM program now offers a superior level of security for protection of valuable data; in compliance with PCI, SOX, SSAE 16 and HIPAA in support of EN 50600 – with unique, personal identification and traceability. The use of biometric access control gives the possibility also of an operator designating specific alarm fingers which both open the system and set off a remote alarm to warn of an operator under threat, so enhancing personal safety. The BioLock, in conjunction with PIN codes and RFID access cards, provides an extremely high 3 level security protection which may be applied on an individual cabinet or on a designated block of cabinets with, for example, a group controller supplemented with separate cabinet release protocols. Multiple releases of separate panels on individual cabinets are catered for by means of linked ELock slave units. BioLock management is handled by means of Control Cockpit software which provides comprehensive control and monitoring functions with the flexibility to add/remove/report/alarm in support of the SYSLOG standard – plus an SNMP interface for integration with third party systems. However, while this high-end security has been developing the more mundane security issues of industrial electrical and electronic control and supply cabinets have not been ignored – such that we now have mechanical solutions such as interchangeable lock cylinders which can be removed and replaced at any point in the installation process. “Everything but the Enclosure” technologies have a long lifecycle and there is much from pre-2000 which is still perfectly suitable, but elsewhere we have seen refined engineering capability for standard and custom products including friction welding, sintered metal production and 3D CAD modelling, a process which has not only enabled development of more complex designs, but also put the panel engineer in direct contact with the product designer via detailed downloadable drawings. Much too has changed in the small things like gaskets – often overlooked – we can now source pre-cut, pre-assembled and vulcanised gasket, installation-ready without messy cutting and gluing. EMC gaskets have become mainstream, while a major demand has been identified for fire protection and high temperature gaskets in EPDM and silicone. Previously, assembling rod locks took many minutes, now advances in design and plastics technology mean that rod guides can be fitted in seconds while precision plastic mechanisms provide quiet operation and more comfortable feel than older style units made from die castings or metal stampings. Rod systems not only improved, they moved. At one time only installed inside the gasket area, rod lock systems migrated beyond the gasket, at the same time freeing up door areas and enabling simpler sealing arrangements for locks etc. Growth in technology and sophistication of design has been matched with commercial developments which support specialist enclosure and panel builders – toggle latches continue to find new application, torque/friction hinges have become mainstream – not just something to be used on expensive electronic devices, and in response to globalisation we see also an expansion of UL certification. 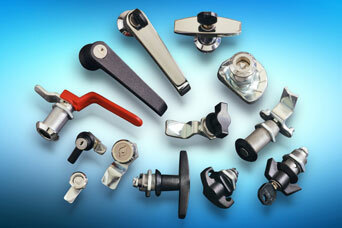 Share the post "Cabinet and Enclosure Hardware Developments at EMKA in the 21st Century"